Tell us a little bit about yourself. How did you get into skincare? I’m Frankie - a blogger, photographer, & writer based in the Midwest. I post about skincare, beauty, and lifestyle finds at @frankies.skin & www.frankiesskin.com. My journey into skincare took over 2 decades before I really committed to it. I struggled with psoriasis and eczema as a teenager, and it took a lot of trial and error, research, etc before I would find a way to soothe my skin. In my early 20’s I studied perfumery, and went on to launch a career in the industry for a few years. It may seem like a diversion, but the basic chemistry involved in creating perfumes set me up for a lifelong interest in skincare chemistry. It was like years of skin issues finally made sense! And I was hungry to learn more (I still am)! However, my interest in skincare didn’t just stop with the chemistry/research side of things. In my early adulthood, I was diagnosed with a chronic illness that started affecting my skin, motor function, cognitive abilities, etc. I felt helpless trying to cure it and get back the executive functioning I had lost. So I started eating healthier, switching up my medications, & changing my lifestyle completely. Despite my best efforts, my skin started getting worse due to my autoimmune disease. I would wake up with painful, scaly skin all over my body. It was like all the sebum, collagen, elastin, and fat was sucked out of me - and I was left with leathery, bruised, thinning skin. These days my skin still struggles with these issues but I’ve found ways to cope, and products that help alleviate the symptoms. 3. Exfoliating treatment (this can consist of AHA’s, BHA’s, or a combination of both. Most importantly, I limit this step to 2-3x a week, max, in order to give my skin a break and prevent over-exfoliation). After any actives have been applied, I highly recommend taking a 10 minute break to make sure everything has absorbed before continuing on with other steps. I always finish off with a gel-cream or sleeping mask because I absolutely love the way it seals in my routine for the night. I make sure the gel-cream or sleeping mask is mostly water based, because water cannot penetrate oil, and therefore it sits “on top” of the facial oil at night… leaving me with glossy, dewy, hydrated skin that lasts for 8+ hours! What IS your morning skincare routine like? That’s it! Only 4 steps total! I truly believe most people can protect their skin in 4 steps (or less), and it doesn’t take a huge budget to do so. How do you go about finding the 'right' products? 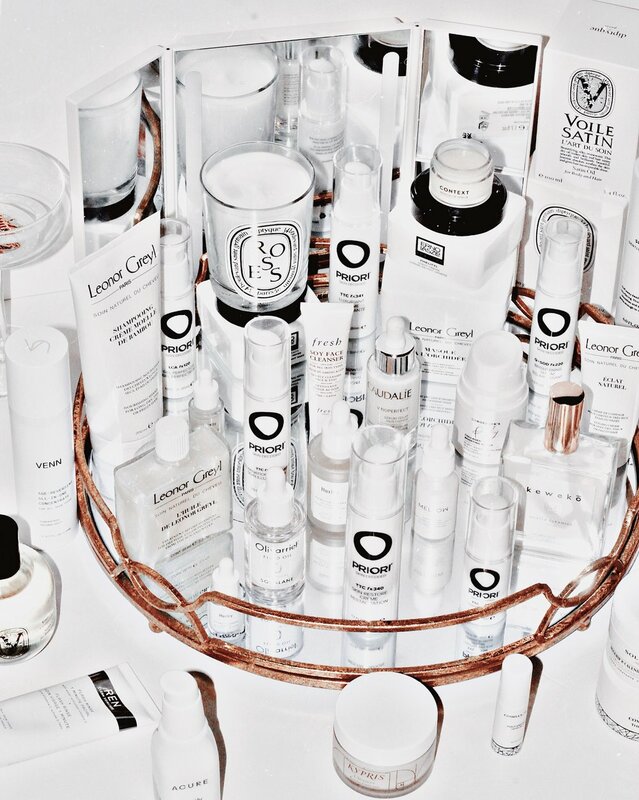 It is so difficult to find the right products for your skin type, skin concerns, and textural preferences! I used to look at ingredient lists alone in order to help me decide what products to go with – through educating myself I would be able to successfully guess what the texture, feel, and efficacy of the product would be based on its ingredient list (and the order, concentration, and interaction of those ingredients). Most people don’t have time to do this much research, and to be honest, neither do I. It’s exhausting! I do think that certain blogs can be an amazing resource when it comes to finding the right products. 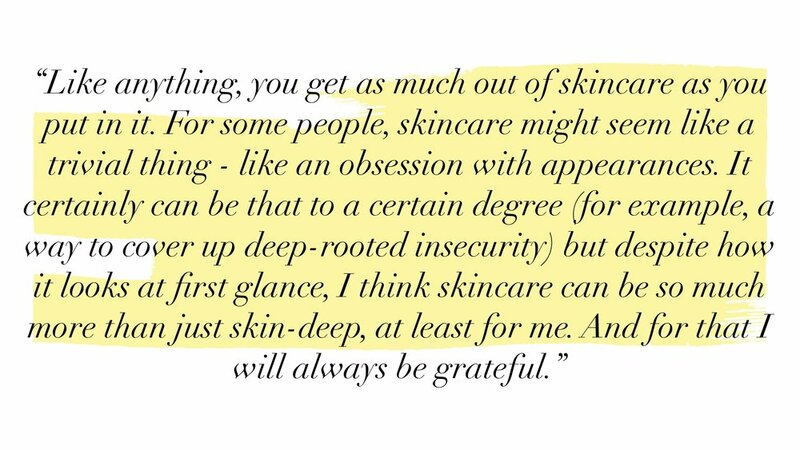 Caroline Hirons is one of my favorite bloggers because of her knowledge of skincare, wicked sense of humor, and willingness to go against the grain. I recommend finding a blogger you can trust (preferably one who is very knowledgeable about skincare and honest about the products that don’t work for them). I always tell people to start slow and build up with their routine. Find a fragrance-free, PH-balanced line to start with – that way you can build the foundation of your skincare. Most people don’t even know their own skin type so it can be challenging to know what types of products to look for. Certain brands like Olivarrier, Cosrx, Cetaphil, CeraVe, Iunik, Purito, & Klairs are a great place to start because they offer fragrance-free, PH-balanced formulas at a very affordable price point. They also have a lot of hydrating options (if you don’t know your skin type yet, you can at least assume you’re dehydrated as almost every person on this planet is! 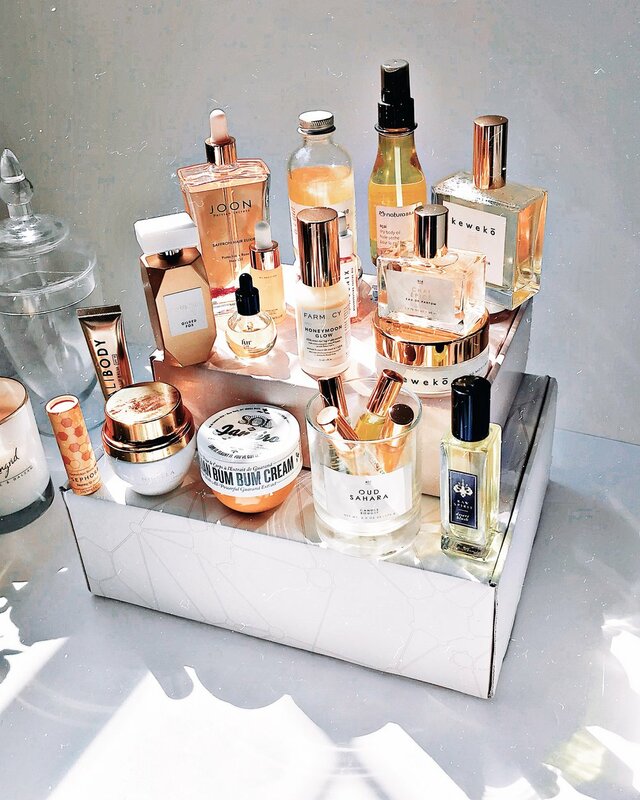 Oily and dry alike…) If you’re able to splurge a bit more, then Biologique Recherche, Paula’s Choice, Clinique, First Aid Beauty, & Drunk Elephant are all gorgeous fragrance-free lines that have good basic options for starting a routine as well as more complex formulas for intermediate skincare enthusiasts. Priori is actually one of my absolute favorite lines to recommend to beginners as well as experts because the formulas are SO effective, sensitive-skin friendly, and professional grade. They have basic formulas for beginners as well as really complex super star formulas that treat bigger skin issues. “Do no harm” should be the first rule of skincare – which explains why fragrance-free, PH-balanced, sensitive-skin-friendly formulas are so important. But once you have a basic routine nailed down, you can start playing with active ingredients, more complex formulas, etc. Priori is great because they offer complex formulas that are gentle enough to be sensitive-skin friendly. Once you have the right products down for those 3 steps, you can experiment with more complex formulas. But always patch test, and make sure you only add in one new product at a time to gauge your skin’s reaction! What are three of your desert island products? My favorite skincare product of all time is the “Signature Tone Up Water” from a small brand called Aqutop. It has all the hydrating benefits of May Coop’s raw sauce with protective qualities of an emulsion formula – but without any penetration issues. It has that incredibly “silky” feeling that emulsions give you, and provides similar protection for the moisture barrier! Indeed, the toner is as light as water and despite the protective nature, it’s very breathable and will help your other skincare products absorb better too. I measured this with a skin analyzer device and was floored! What is your goal with @frankies.skin? What are your tips for up and coming skincare enthusiasts, bloggers, etc who might be new to skincare? One of the biggest things I need to make clear is that you do not have to spend 2 hours a day, or use 10 step routines to see a difference! Nor do you need 75 products or a huge bank account to take care of your skin. A lot of the messages we get from social media are designed at making us buy more, and feel less - like we’re not good enough, pretty enough, healthy enough, or rich enough. But nothing could be further from the truth! Self care is not about owning the latest product or having perfect hair/skin/nails. Self care can certainly incorporate practices like skincare, but it can also be as simple as starting a meditation or gratitude practice, saying no to things you don’t want, and asking for help when you need it. These things are often overlooked in social media but they are the most important. For beginners, I want to emphasize that pretty pictures are NOT what skincare is about. Nor is it about perfection. Pretty pictures are such a wonderful way to express your creativity but whether or not you have time, skill, or passion for photography, you belong in the skincare world just as you are right at this moment. 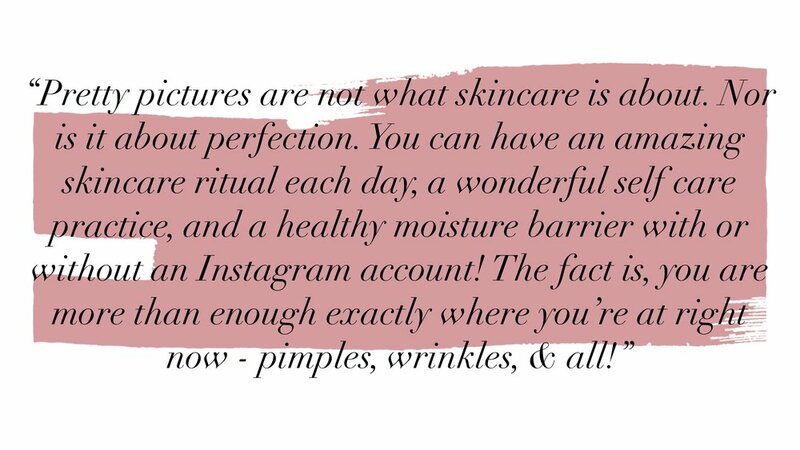 You can have an amazing skincare ritual each day, a wonderful self care practice, and a healthy moisture barrier with or without an instagram account! I guess what I’m trying to say is, you do not need to change anything about yourself, your product collection, or your skin. The fact is, you are more than enough exactly where you’re at right now – pimples, wrinkles, and all! 2. SPF is vital, and so is protecting your moisture barrier. I’d say that at least 90% of the people I meet (including myself) have a damaged moisture barrier to some degree or another which often comes up in the form of dehydration. If you’re one of the lucky 10%, well, just wait until you age a bit, haha. Most of the people I know with normal skin types are quite young, as we age our collagen and sebum production declines and we’re left with dry, dehydrated, dull-looking skin. The simplest of routines can actually help that – all it takes is a gentle PH-balanced cleanser that won’t strip your skin, followed up by a hydrating toner, and an occlusive moisturizer (SPF goes on last during the daytime!) These simple steps can go a long way when it comes to protecting your skin and treating a damaged moisture barrier. Please don’t underestimate the power of SPF either, it is the number one anti-aging product there is out there, and it’s pretty inexpensive too. What is your favorite Priori product and why? Priori’s Gel Perfector is a close second choice for me, it’s a water-based gel formula that was designed to help the t-zone area and reduce the appearance of enlarged looking pores! Even though I don’t have an oily t-zone, I struggle with breakouts in that area and this product has worked wonders at preventing them. I actually use this all over my face because the results are so impressive. I notice a huge reduction in pimples, pigmentation, and redness in general. My pores appear much less clogged, and my skin is less flaky. This gel perfector is another superstar with retinyl palmitate, vitamin c, vitamin e, and lactic acid. The total actives used makes up 16% of the formula! It also contains 1% salicylic acid, an FDA approved acne treatment that actually works. Lastly, they added in peptides to help boost collagen production along with glycerin, a humectant that draws water into the skin and hydrates deeply. Think of this like a supercharged water based serum that treats all of your skin issues at once. When combined with the brightening serum, my skin has seriously never looked better! I also have to mention the Hand and Body Replenisher because it’s the best body care product I’ve tried to date! It has the same 16% of actives as the gel perfector, but it’s moisturizing and hydrating at the same time. The formula comes out like the silkiest emulsion ever, it’s almost like a gel-cream, and it absorbs into the skin immediately without any white cast, pilling, or residue. For that reason alone it beats 90% of the body care I’ve tried. But the other reason I adore it is that it has helped my body acne, keratosis pilaris, and dryness SO much because of the concentrated lactic acid, retinol, vitamin c, etc. We often focus on our face and overlook our bodies, and I’m guilty of that as well. Thanks to Priori the skin health of my body is starting to match my face! The Hand and Body replenisher has been especially helpful for trouble spots, my upper arms, elbows, forearms, knees, and calves. What is your favorite thing about skincare? I love how skincare is a mix of art & science, health and self-care. It can be used for basic protection from the elements, but it can also be an incredible self-care ritual, an artistic expression of yourself, and a way to connect to others. 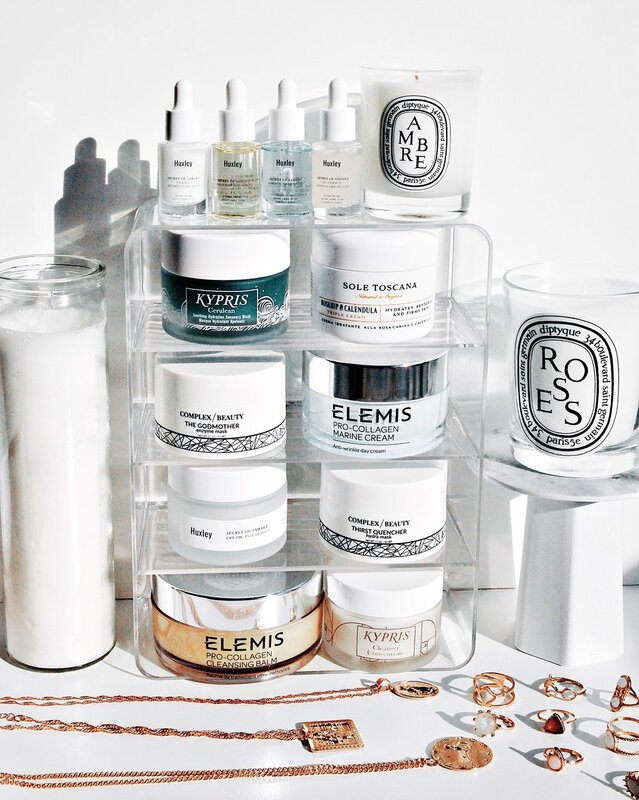 Skincare, for me, is important from a health stance but it can also be an incredibly luxurious, meditative ritual, and one that I look forward to daily. Since our skin is our largest organ, and also our first line of defense against bacteria/viruses, etc… it’s very important to take care of it and protect your moisture barrier from getting damaged. At first glance, it might seem like a superficial, external thing to some people but as someone who suffers from an autoimmune disease AND lives in a cold climate, it is actually vital to my health and well-being. Taking care of my skin has improved my eczema and psoriasis so much, which actually is one of the ways I keep my pain levels under control. Of course protecting the moisture barrier can be as simple as a 3 step system of cleansing, moisturizing, & applying spf. But if you want to enjoy the more meditative/ritualistic experience you can turn this into a 5 step, 7 step, or even 12 step experience! It’s totally up to you – your time, energy levels, budget, etc. When I don’t feel at home with who I am, life is painful. When I don’t feel at home with the rich diversity of beings with whom I share this planet, life is frightening. As we do so, the pain and fear that come from feeling alienated from ourselves and others fade away...and so do the societal ills that are animated by alienation. Imagine a world in which people feel so at home with themselves AND in the company of strangers that they can make hospitable space for others to feel at home. In our divided world right now, in the world of social media and unrealistic expectations, I think we owe it to our hearts to let ourselves, and others, belong. This time of year is riddled with desire & disappointment. With new year’s resolutions and unmet goals. With questions like “is my work good enough? Am I good enough?” buried so deep inside us we’re afraid to face them... New Year’s Eve can be a time of beginnings but for many people it’s a time of endings, and a reminder of what has been lost and the loneliness felt in the process. So while it’s still the holidays, I think it’s the best time to share this poem. 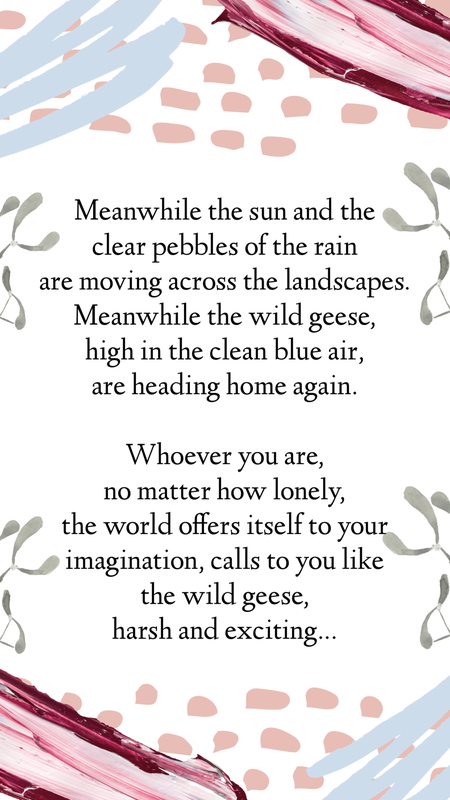 Mary Oliver is one of my favorites as well, and I routinely read her work on New Year’s Day, as it so beautifully touches on what my heart needs to hear this time of year. I hope it’s what you need to hear as well.